When you’re ready to make your move, it’s important to consider the effects of the day on your furry friend. Dogs aren’t especially keen on having strangers show up and start deconstructing the family castle. Here are a few tips to waylay aggression, squash stress, and out anxiety for your canine comrade on moving day. When searching for a home, be sure to keep Fido’s needs in mind. If he’s a large breed, he’ll probably need a yard to run and play in. If he is older and has trouble getting around or a breed predisposed to hip or back problems, a multi-level house may be hard for him to navigate. Take a look at home prices in your area to make sure you can accommodate him. In West Jordan, UT, the average home sale price is about $310K, so take that into consideration. For example, big homes with large, fenced-in yards may be a bit more expensive than that average, so ask yourself if you can afford that. If you can’t, a smaller dwelling close to a dog park should be on your home-buying radar. Your dog likely won’t take well to new people removing things from his territory. As a pack animal, your dog’s space – and the people and animals within it – are his means of survival. Movers, who the dog has likely never met before, threaten that stability. Your dog may act aggressively toward the very people you’ve enlisted to help relocate your dog’s den. Prepare yourself for this behavior by asking the movers to introduce themselves to your dog. Provide them with plenty of treats and keep Fido on a leash just in case he gets a little too friendly, or simply doesn’t warm up to the movers. Just like children, dogs thrive on routine. This makes moving tough on pets who’ve only known one home. The Nest asserts that moving to a new home can cause fear and confusion, and that leads to all sorts of unintentional behavioral issues, such as stress incontinence and excessive barking. 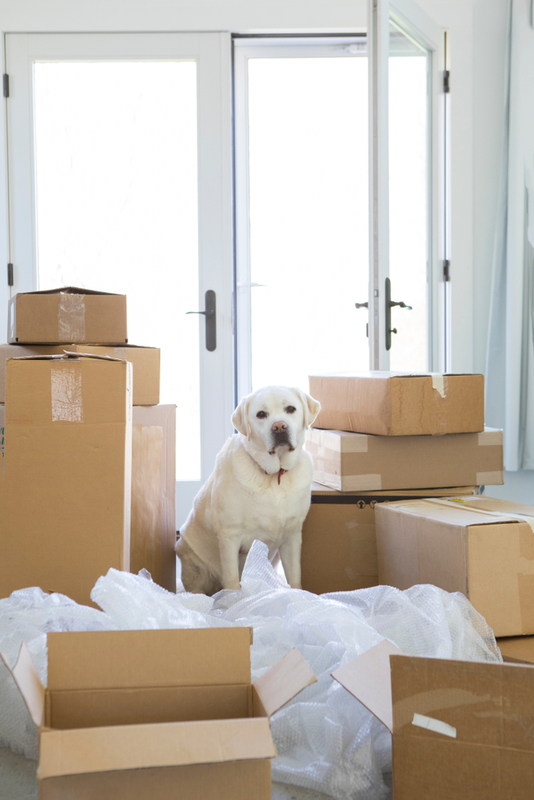 Ease your dog into the move by packing in stages. Start with areas your dog doesn’t typically use, such as a guest bedroom, attic, or basement. As the big day gets closer, pack off-season clothes and seasonal items (grill, sleds, etc.). Save the main living and sleeping areas for last and keep your dog’s comfort items within reach at all times. You’ll need these for moving day. Once you’ve made your introductions, consider taking your dog on a day trip to a boarding facility or hiring a pet sitter to care for him outside of your home. At a boarding facility, your dog will have the opportunity to mix and mingle with other mutts, while a pet sitter will give him one-on-one attention and love. Both will keep him blissfully ignorant about the chaos of the move. Your moving company quotes contain what they cover and what they don’t. These documents will also outline any extra charges associated with labor performed while dogs are on the property. Some charge more to offset the potential cost of paying for accidents or injuries caused by the dog. Find the right moving labor help by reading reviews and asking lots of questions. If possible, arrive a few minutes before your dog and have his personal belongings waiting. This includes his bed, favorite toys, food bowls, and other keepsakes that he or she can’t live without. Your dog will recognize the familiar scent and may acclimate to the new home faster. Despite your efforts, there is no surefire way to guarantee that your dog won’t misbehave on moving day. Remember, he is only acting naturally, and his behavior makes perfect sense to him. Be patient, provide positive reinforcement, and, most importantly, take steps to ensure your dog is safe both on the road and at his new home.